Music played a large part in the lives of the Victorians and Edwardians, and with the boom in the music industry in the 1870s and 1880s, not only was a piano de rigueur in the middle class home, but musical talent was encouraged in both males and females. During the turn of the century, parlour music–that is, music “intended to be performed in the parlours of middle class homes by amateur singers and pianists”–created a sharp increase in demand for sheet music of the day’s latest hits. Now you could hear a popular song performed on stage, and then rush to the nearest music store to purchase the sheet music and learn to sing and play it at home. This was lucrative business for many publishers, and soon, more and more songs were composed specifically for this amateur market. The birth of ragtime also coincided with the popularity of parlour music, and composers and lyricists such as Scott Joplin, Irving Berlin, and George M. Cohan (all of whom were considered leading names in Tin Pan Alley) earned considerable royalties from their talents. Though the music industry was dominated by men–as were most industries, naturally–there were a few women who managed to break in, though Carrie Jacobs-Bond was the only woman to own every word and note she wrote. Jacobs-Bond was distantly related to Home! Sweet Home! lyricist John Howard Payne, but she did not rely upon this tenuous connection when she forged her own musical career after her second husband, Dr. Frank Lewis Bond, died of crushed ribs after an accident. During their marriage, she supplemented the household income with her painted ceramics, piano lessons, and minor musical compositions, but as a widow, this proved inadequate. 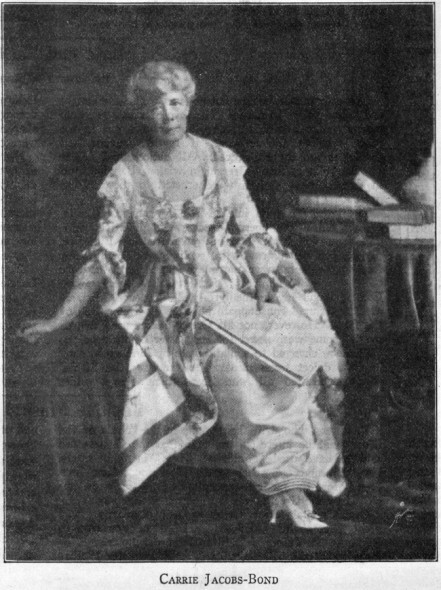 Jacobs-Bond and her son moved to Chicago to be nearer music publishers, and she slowly built her reputation by singing in small recitals in local Chicago homes. Jacobs-Bond got her first big break when her neighbor, a young singer, asked Jacobs-Bond to entertain her manager after an unexpected emergency. The manager, Victor P. Sincere, was impressed by Jacobs-Bond’s compositions, but she turned down his offer to have them performed because they were not under copyright. But she did ring up opera singer Jessie Bartlett Davis, hoping Davis would popularize her music. Davis instead volunteers to pay for the publication of Jacobs-Bond’s best compositions, which were released in 1901 as Seven Songs as Unpretentious as the Wild Rose. It was an instant success, enabling Jacobs-Bond to expand the small music publishing company she’d formed with her son in 1896. With complete ownership of music published with the Bond Shop, Jacobs-Bond’s was financially solvent, not in the least because her most enduring hit “I Love You Truly” made her the first woman to sell one million copies of sheet music. Her reputation for simple, yet sentimental songs was set when she performed for Theodore Roosevelt, gave a series of recitals in New York City and in Europe (this paired her with the famous tenor Enrico Caruso), and collaborated with the celebrated African-American poet Paul Laurence Dunbar shortly before his death in 1906. In 1910 she published “A Perfect Day”, which sold five million copies, and Elsie Baker’s recording of “I Love You Truly” became the number one hit of 1912. The latter was a highly popular song played at weddings, and was ultimately covered over the course of the twentieth century by Sophie Braslau, Bing Crosby, Jeanette MacDonald, and Connie Francis, as well as being featured in numerous Hollywood films. Hoover wasn’t President in 1946, Truman was.